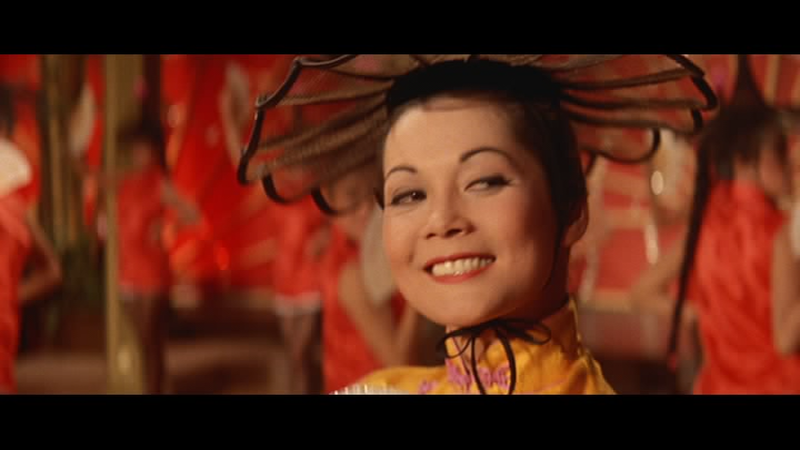 After watching THE WILD AFFAIR, in which Nancy Kwan is delightful, Fiona wanted more, so we ran THE WORLD OF SUZIE WONG (some nice elaborate Richard Quine long takes) and then FLOWER DRUM SONG. 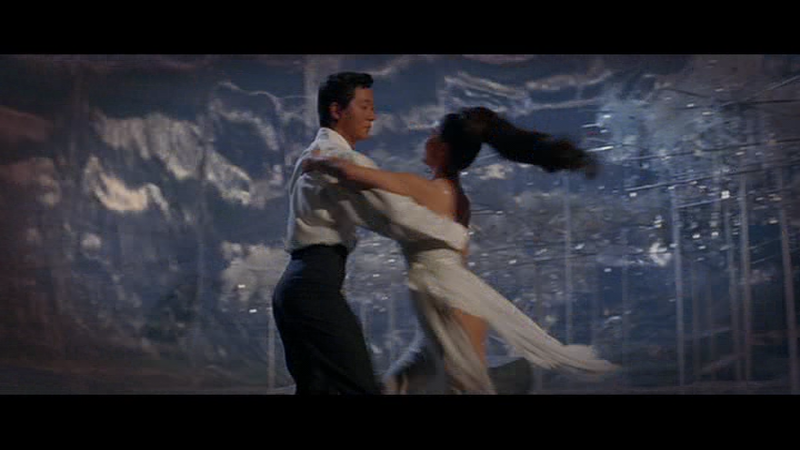 FLOWER DRUM SONG is an interesting period piece — some of the DVD extras consider the ways in which the passage of time has changed it from a rather forward-thinking piece, in the days when the very act of making a musical about Chinese-Americans was a radical and positive thing, to a slightly embarrassing hangover from an earlier age. But nobody quite gets to the nub of it, I think. Rodgers & Hammerstein’s musical is entertaining and funny, and pleasingly presents its Chinese and Chinese-Americans as being just regular folks, with a few different customs but with all the same drives and qualities as anyone you might meet in a movie about white folks, which is fine. It’s just that a lot of the jokes are based around producing Asian versions of conventional situations or dialogue — so someone talks of being “left with egg foo yung on his face,” which isn’t a real expression, just a silly version of an American expression with a bit of cod Chinese culture tacked on as a laugh. It might or might be amusing, but it’s certainly inauthentic, and there’s a point at which the inauthentic becomes slightly racist. Any time you can’t be bothered to get the details right, you’re showing a lack of respect. In Fellini’s CITY OF WOMEN, we are told that all the feminist statements are based on actual proclamations by feminist thinkers. If this is true (always highly doubtful with Fellini) then the filmmaker would be showing a kind of respect to the people he is satirising — he lets them condemn themselves as absurd out of their own mouths. He plays fair. But in HORSE FEATHERS, not only is Groucho’s anatomy class complete gibberish, the serious class he interrupts is equally nonsensical, basically just a stream of long words most of which have nothing to do with the ostensible subject. In this way, the writers show themselves to be above the subject, disinterested in accuracy, and ally themselves with the Marxes’ anti-intellectual side (Harpo is seen gleefully shoveling books into a roaring fire, in hindsight a disturbing image for 1933). 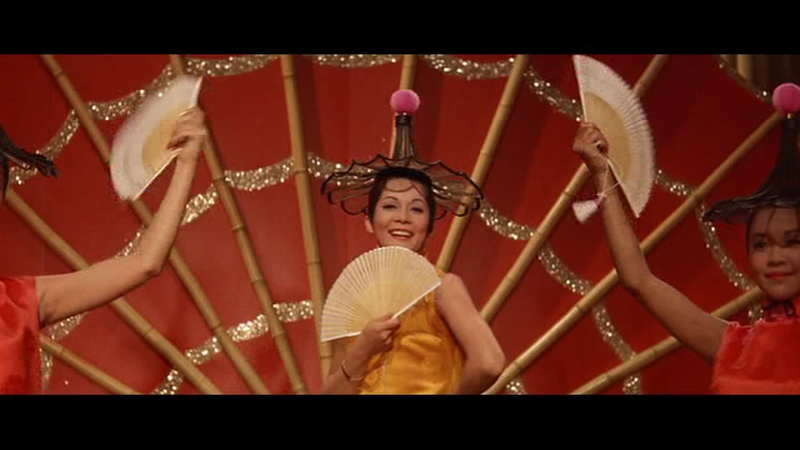 The racism in FLOWER DRUM SONG is super-mild, it doesn’t mean to offend, and it doesn’t even mean to be disrespectful. It’s just levity, but not quite the right kind for us today. I’m not even sure if it would offend anyone, but it does embarrass. At one point in the film, a Chinese character actually says, “They all look alike,” referring to white folks, which I guess is intended as a kind of satire, but is actually sort of true — we often find it harder to tell apart people of different races from themselves, since what we notice first are the “racial signifiers” of the other. The problem is solved by spending time around people of different races. 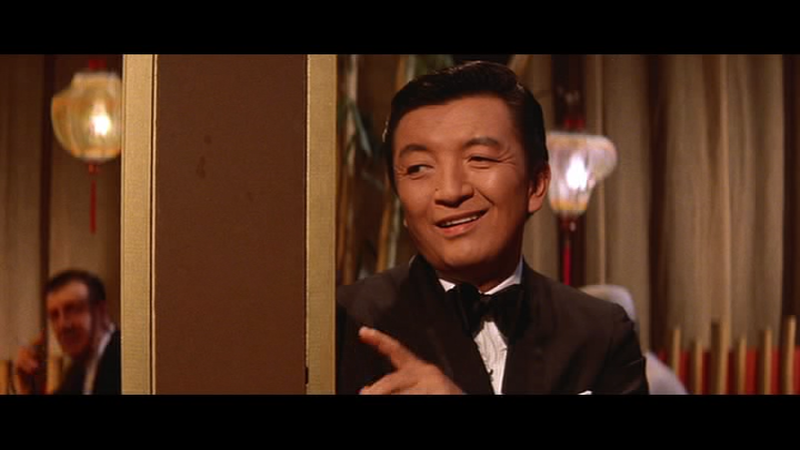 It’s not a problem one could ever have with Jack Soo (a Japanese-American who changed his name to a Chinese one in order to get a role in the Broadway production), though. He’s incredibly distinctive, though, and a lovely presence — he talks like Robert Mitchum, only even more hep, and looks like Brundlefly. I wish he was in more movies.